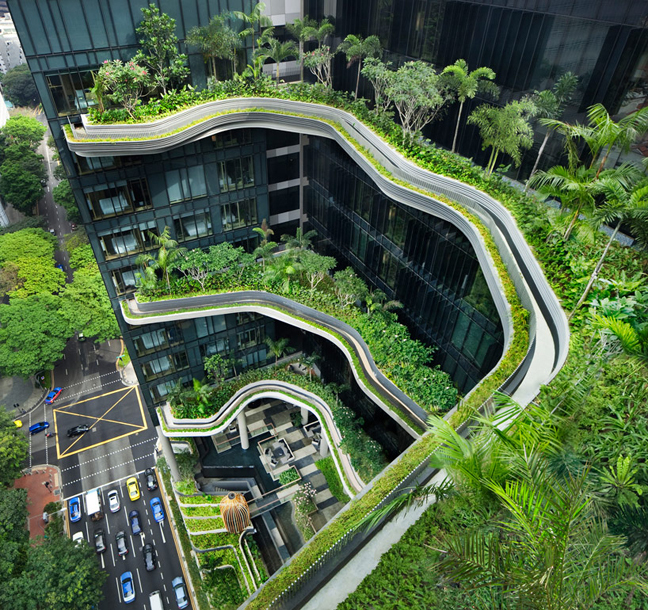 A total of 15,000m2 composition of skygardens, reflecting pools, waterfalls, planter terraces and green walls were designed by WOHA for the Parkroyal Hotel pickering. 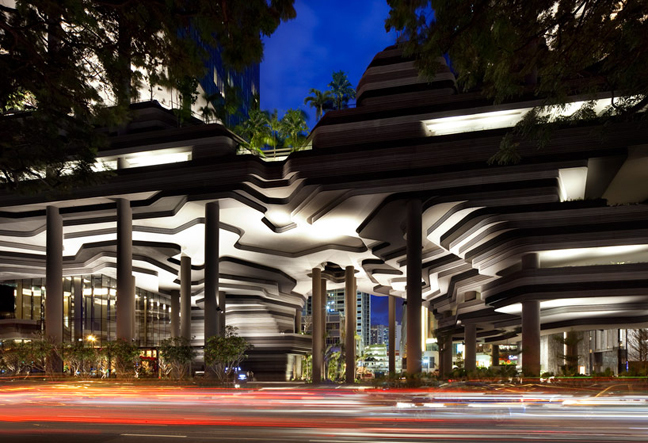 An expansive site located in central Singapore is now occupied by a diverse variety of species ranging from shade trees, tall palms, flowering plants, leafy shrubs and overhanging creepers come together to create a lush tropical setting that is attractive not only to the people but also to insects and birds, extending the green areas from Hong Lim Park and encouraging bio-diversity in the city. 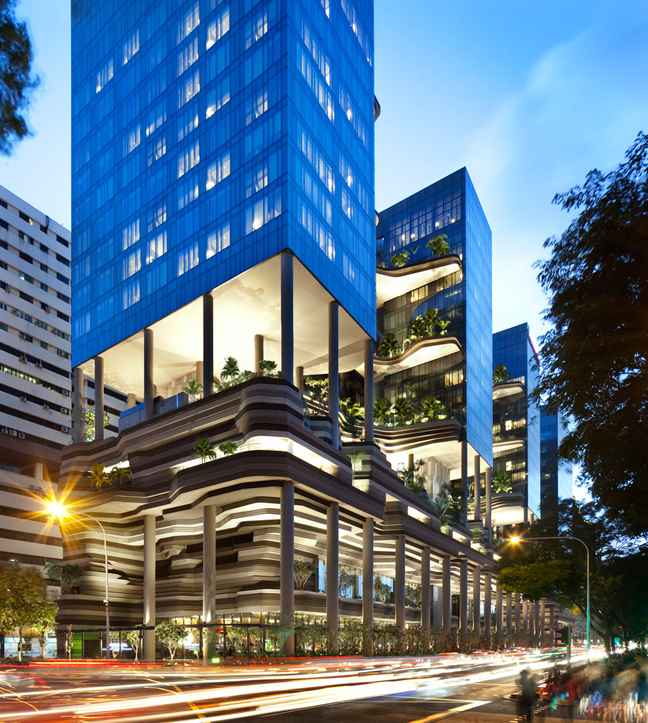 Designed as a hotel and office in a garden, the project at Upper Pickering Street is a study of how architecture can not only conserve our greenery in a built-up high-rise city center but multiply it in a manner that is architecturally striking, integrated and sustainable. A contoured podium responds to the street scale, drawing inspiration from a combination of landscaped bonsai arrangements that are modelled, chiselled and spliced to mimic natural landscapes and mountain rock formations as well as that of the contoured padi fields of Asia. On the ground the contours create dramatic outdoor plazas and gardens which flow seamlessly into the interiors. Greenery from the park is drawn up in the form of planted valleys, gullies and waterfalls. The landscaping also conceal openings to the above ground carparking while allowing in air and natural light. The top of the podium is a lush landscaped terrace housing the development’s recreational facilities, with infinity edge pools opening up unobstructed views of the city.